ScaleRichView is a set of Delphi/C++Builder VCL and Lazarus (Free Pascal) LCL components for WYSIWYG editing (“What You See Is What You Get”), created basing on TRichView and RichViewActions. 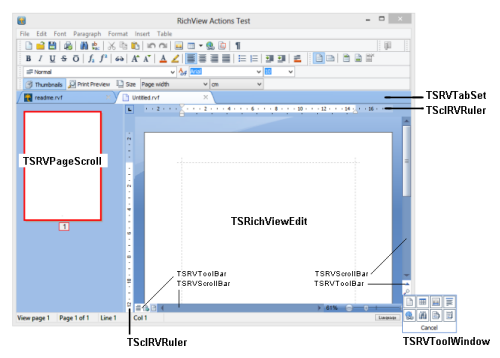 ScaleRichView uses TRichView engine for document rendering, but it repaginates, scales and draws pages in its own way. A document in ScaleRichView is accessible via hidden (or external) TRichViewEdit component, so you can use the same methods for document generation and editing as you use in TRichView. Headers, footers, endnotes, footnotes and text boxes are accessible in a similar way. editing a main document, headers, footers, footnotes, endnotes, text boxes directly in the editor. TSRichViewEdit – text processor for WYSIWYG editing, with scaling and multiple layouts (including page view mode). TDBSRichViewEdit – data-aware version of TSRichViewEdit. TSclRVRuler – ruler, an analog of TRVRuler from RichViewActions, but working with TSRichViewEdit. 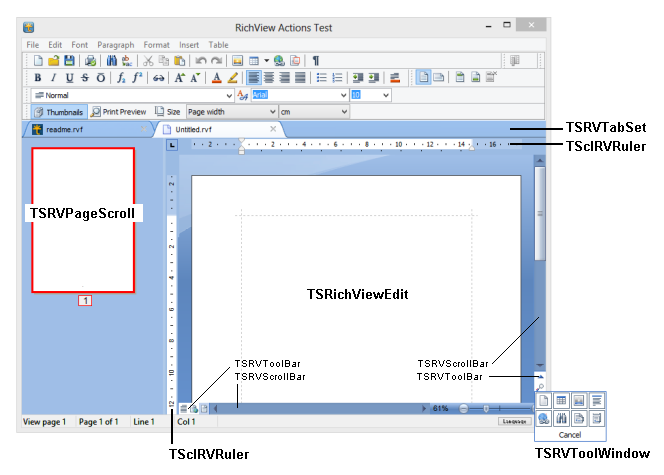 TSRVToolBar – toolbar for insertion in scrollbar area of TSRichViewEdit. TSRVScrollBar – a skinnable scrollbar; this component is used inside TSRichViewEdit, but may be useful as a separate component as well. TSRVTabSet – a skinnable set of tabs having icons and text labels; this component can be used to implement a tabbed multiple document interface.